I was asked to create two cards for a 60th birthday. This is the first one I came up with. It's a no-stamp card (sorry for that! ), but I like it nevertheless. The flowers are cut with the Cricut machine, and I used this wonderful dp from CreaMotion. The sentiment is Word-printed, then punched with a Marvy Scallop Oval punch. I added some light brown rhinestones. This is the second one I came up with. Today's featured stamper on SCS is Becca - look at her wonderful gallery! 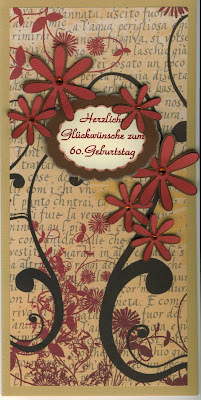 I used this wonderful card by Becca as my inspiration piece. I tried to imitate Becca's wonderful subtle chalk coloring (I guess I need some more practice for that...) on a cuttlebug-embossed background, added a decorative corner (cut with a Sizzlits die) like Becca did and used some little pearls as embellishments (hard to see on the photo) - Becca used rhinestones. I changed the size of the card, the way of displaying the sentiment, the ribbon and the layers, and I added a flower (stamped with SU "Both Way Blossoms" stamp and colored with metallic watercolors (by Yasutomo) and Tombow markers, cut out closely and mounted on foampads). What do you think about both cards?